Please contact the reception of PSI West and ask for your badge and the key for your room in the guesthouse. If you arrive out of office hours (Mon-Fri 07:45 - 17:00) please pick up the phone at the entrance and call the security guard (phone number: 8350). Every two years the PSI safety training course has to be refreshed. The PC based training is located in the main building of PSI West WHGA in front of the library (please follow the signs). Further details will be given at the PSI reception. After passing the couse successfully you can pick up your dosimeter and start your experiment. Users can perform the PC training already in advance. Please visit the website of the PSI radiation protection school and follow the link 'Interactive Radiation safety introduction program' to start the powerpoint file. Please also have a look on the safety instructions and guidelines. 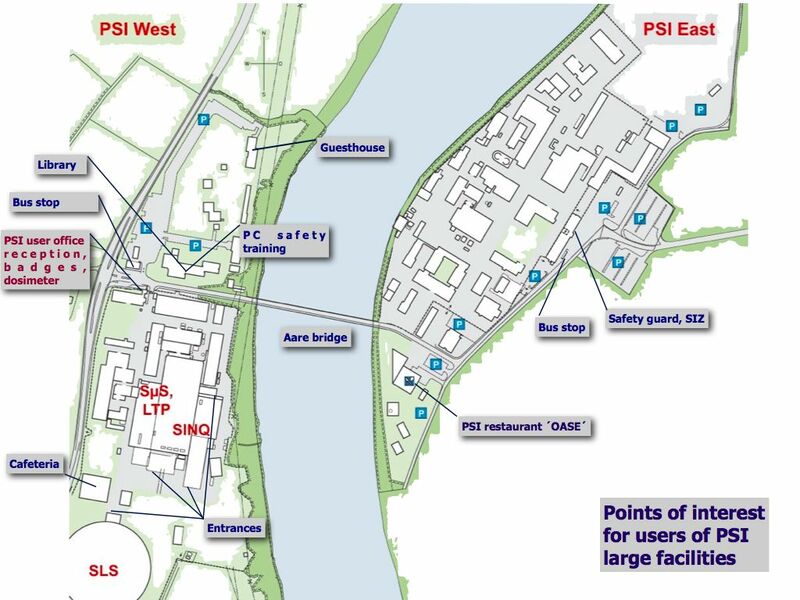 Maybe this map of PSI helps you to find your way to the various facilities on the campus. If you face any problem regarding computing during your stay at PSI please contact the PSI computing helpdesk. Office space for our short term users is available in the new building WBWB next to the PSI Guest House. The open-plan office is presently equipped with 12 desks, 32 lockable cabinets, a printer/photocopy machine as well as LAN and WiFi access, more information. The PSI user office holds a pool of bicycles (and helmets) for users of the PSI facilities. A bike will make your stay at PSI more comfortable and you will be able to easily reach the neighbouring villages like Villigen, Würenlingen or even Brugg to do some shopping. If you wish to borrow a bike (no costs, just a deposit of CHF 50,-) please contact the user office (call 4666) upon arrival or send an email to us. Please note that the maximum duration for renting a bicycle is 2 weeks. The PSI restaurant "OASE" is open from Mon-Fri over lunch and between 5-8 p.m. in the evenings. In addition there is the Cafeteria "Time Out" on the campus of PSI West next to the SLS main entrance. The "Time Out" offers fresh food and sandwich lunches during and food from vending machines out of office hours. Please note that the PSI restaurants partly do accept credit cards. In addition you can pay cash (CHF or EUR) or you may upload your PSI badge with Swiss Francs. In addition a Pizza service and several food trucks are available between Friday night and Sunday. Please visit this page for more information. The PSI Sportclub offers several sports activities. In particular gym access is offered for the residents of the PSI Guest House. In case you are interested please fill in the web application form and follow the instructions given there.